Right from the start, we knew our honeymoon needed to be special. The trip we would take to celebrate our marriage would be one that we would always remember. There are an endless number of honeymoon options around the globe for newlywed couples. While the prospect of sipping cocktails on a sandy beach certainly does appeal, we Two Drifters knew that we wanted a bit more wildlife, nature, and adventure. 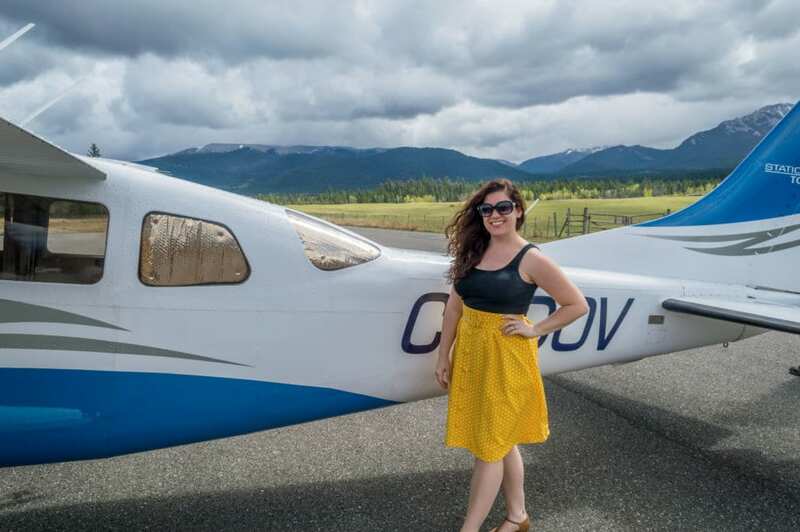 To that end, we ended up heading north for an adventurous honeymoon in Canada. Off we went to a blissful union of ranch and resort, where luxury and relaxation is flawlessly intertwined with the wild outdoors. 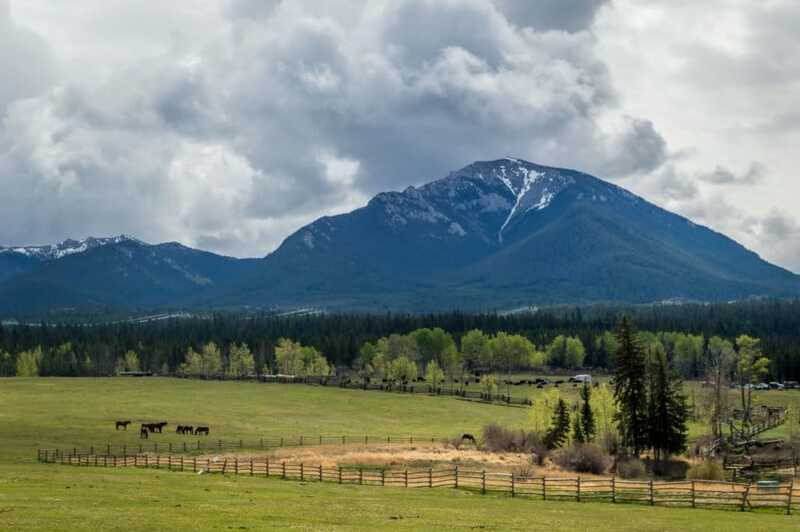 This place was Echo Valley Ranch & Spa in Jesmond, British Columbia. And adventurous it was. We spent 5 wonderful nights exploring the ranch and the surrounding area. First of all, British Columbia is BEAUTIFUL. This was the farthest west I (Amy) had ever been in North America. I’ve always dreamed of the wide open spaces of the west, the broad, starry skies, and that Kerouac-esque feeling of ruggedness. BC did not disappoint. Right away I was struck by the differences in terrain and foliage. The mountains here are big and bold, with jagged peaks. This is very different than the older, rolling tree-covered peaks I’m used to in North Carolina and Vermont. British Columbia is rich in wildlife. We saw a large black bear on the property (luckily from afar!) and heard that such sightings are fairly common. Deer were spotted often, sometimes chilling on the ranch’s private air landing strip (more on that later!). I was very keen on seeing an owl, eagle, and maybe even a wolf to round out my wildlife wishlist, but alas, we didn’t get a chance to see those elusive creatures. I guess you can’t control when the wild creatures make an appearance, eh? Though we didn’t see as much wildlife as I would have liked, the furry friends residing at Echo Valley Ranch more than made up for that. With 5 resident border collies, 4 cats, dozens of horses, a donkey, turkeys, chickens, and more, there were plenty of animals around to bring a constant smile to my face. 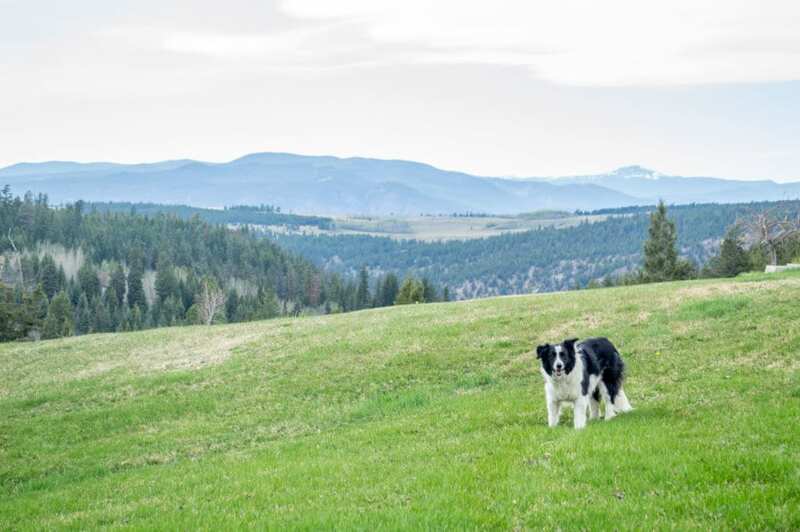 The border collies, which you’ll see in a large number of our pictures, are friendly, smart dogs who are seriously living the life. With 160 acres to explore and a near-constant stream of happy guests to lavish them with kisses, these dogs have it made. 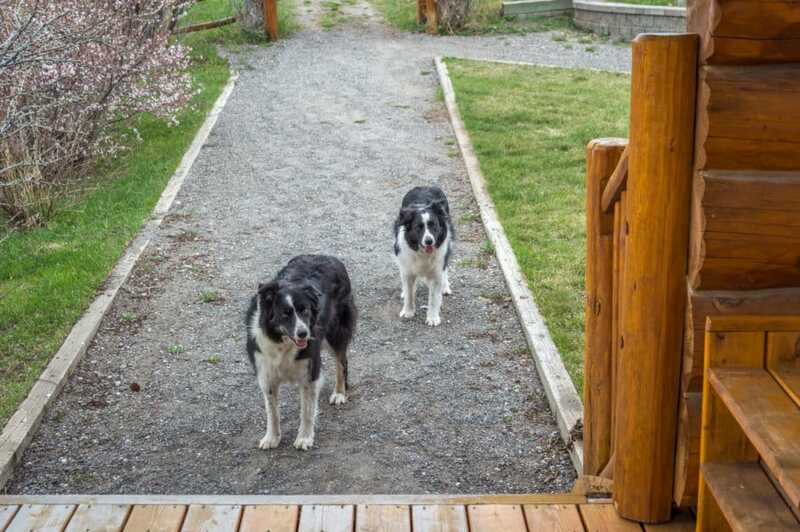 They hung out with Nathan and I frequently, following along–or rather, leading the way–on several of our hikes and waiting patiently outside our cabin door for the chance to catch a frisbee. We were totally in love with the dogs (Joy especially earned a special spot in our hearts) and with all the animals we met. 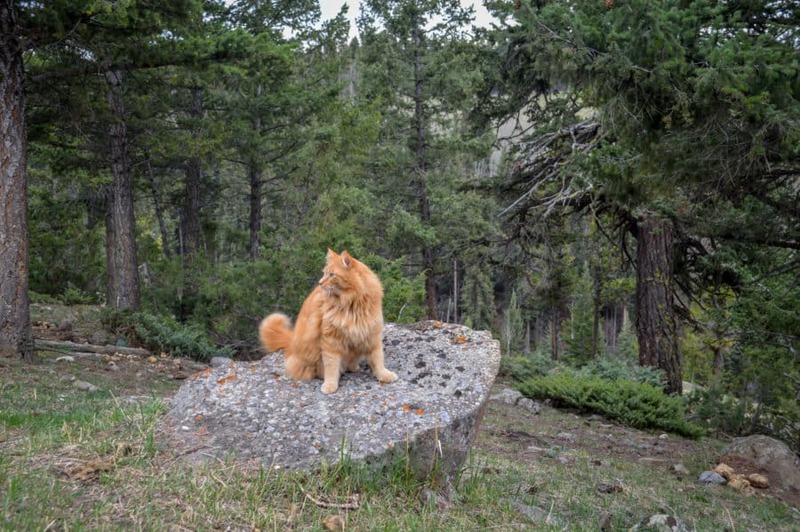 The photogenic ginger cat who actually accompanied us on a little hike! On our first day at Echo Valley, we decided our tired muscles were ready for our Thai couple’s massage. (Planning a wedding certainly takes its toll!) Our incredible spa treatment took place in the Baan Thai, pictured below. Thai culture is an important and fascinating addition to the ranch. 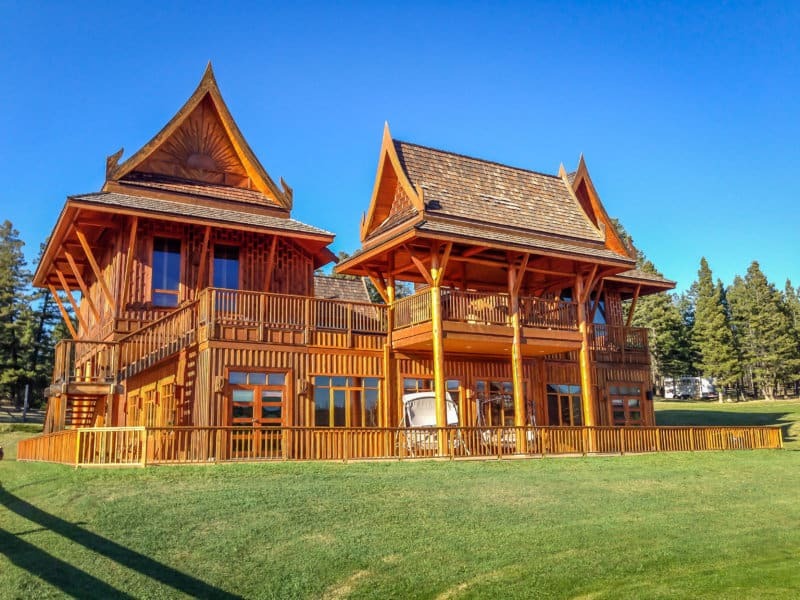 The owners, Norm and Nan Dove, spend their winters in Thailand (Nan’s home country) and employ several family and friends of Thai descent who do the same. This adds a distinctive cultural setting to Echo Valley, and the Baan Thai is a part of this atmosphere. This magnificent building holds one of the ranch’s two spa facilities as well as a large open space for meetings and weddings. Upstairs, across from the spa, you’ll also find the Royal Thai Suite, the ultimate in luxury accommodation. The Baan Thai was designed by the same architect who caters to the Thai Royal Family. Fancy! 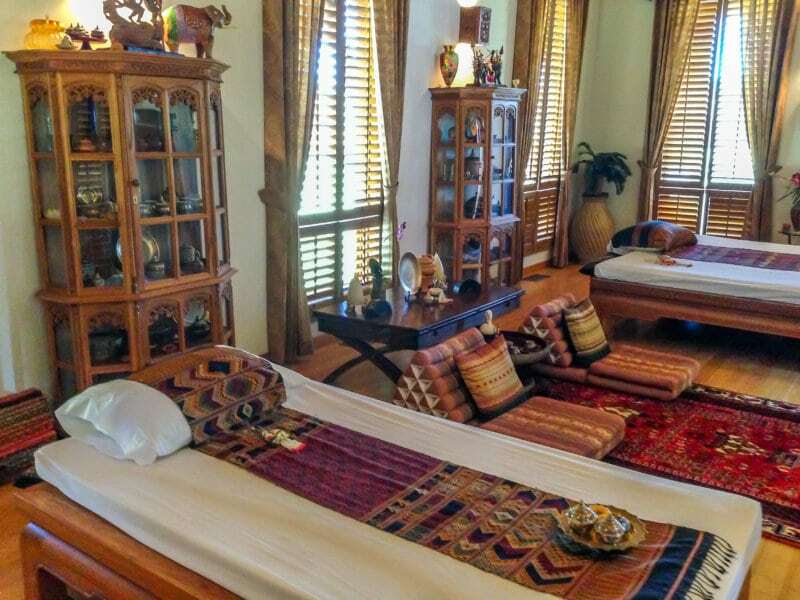 Our 90 minute authentic Thai couple’s massage took place in the Baan Thai. That treatment was probably the most relaxed I have ever felt. After changing into soft white clothes, we lay on separate cushioned platforms and enjoyed an intense and delightful massage. If you’ve never had a Thai massage, I would describe it as part muscle relief, part stretch. The pressure and approach was exactly what I needed. Afterwards, you feel taller, longer, and infinitely more at peace. If I could, I’d have this type of massage weekly, and preferably by the talented masseuses from Echo Valley! Following our fabulous massage, we were treated to a spicy ginger tea. As we gradually returned to the land of the living, we were roused by the knowledge that it was time for lunch. We headed up the hill to the main center of activity, Dove Lodge. 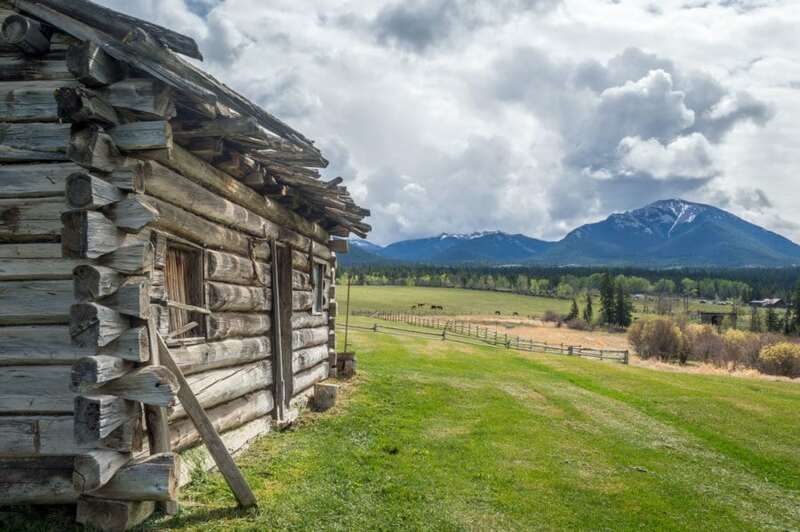 Dove Lodge is where meals and gathering take place at Echo Valley Ranch. Everyone eats together at one long table, and the communal vibe is so friendly and warm. I just loved it. Not only was it cozy and welcoming in the lodge, but have we mentioned the food? With their executive chef, Kaelhub, cooking the meals, Echo Valley’s guests and staff eat like kings and queens. Kaelhub and the team create three incredible meals daily, focusing on organic and local food. It’s so local, in fact, that nearly everything on the plate is a product of the “100 meter diet,” meaning it is grown or produced right there on the ranch. With an attention to delicious flavor and a touch of elegance, the meals are absolutely wonderful, complete with rich desserts and a nice glass of wine. I’m missing it right now. And Thursdays are Thai night, complete with traditional dancing and music! 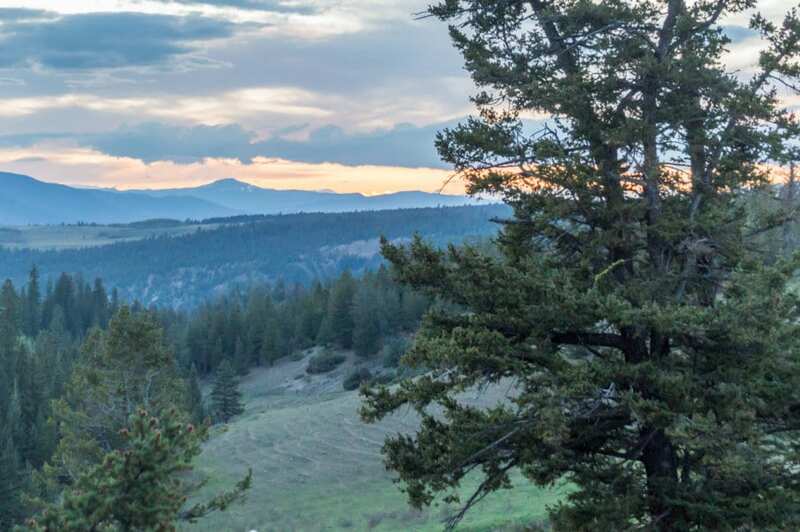 When you’re not enjoying the fresh, healthy meals, there is so much to do on the ranch and beyond. Though we didn’t venture far off the grounds, guests can visit the nearby Fraser Canyon on a 4×4 trip or head up the trail at Bowman Mountain, seen in the photo above. In between dining, spa treatments, and simply relaxing and reveling in the nature, we spent a lot of time with the horses. We went on trail rides and took a basic riding lesson to get us started. The trail rides were a blast. It was just the two of us, along with wranglers Travis, Debbie-Lynn, and Satori, all friendly young people like us who shared an interest in traveling. We went out in the countryside and woods for a few hours, riding at a leisurely pace, and sometimes hanging on as our steeds trotted up the hills. Those were definitely my favorite moments. 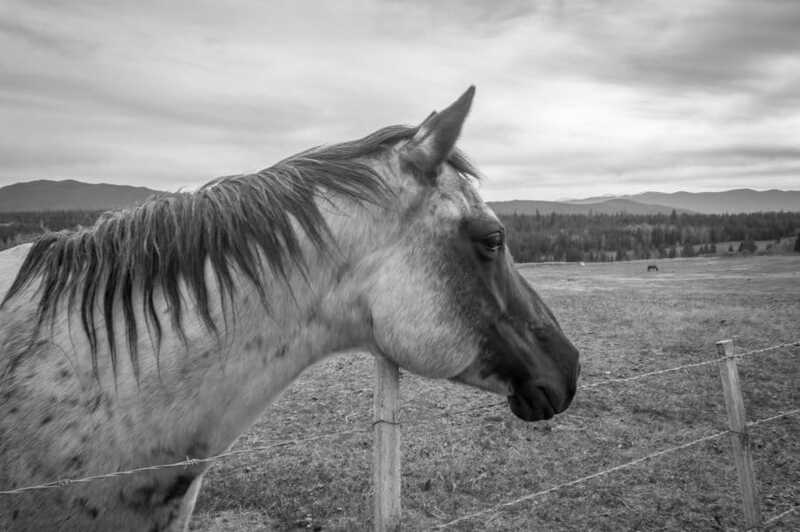 There are dozens of horses at Echo Valley Ranch, and all are beautiful. They are well-trained and beginner-friendly, making it easy for us to guide them along the trails. And they are super photogenic, too! Echo Valley Ranch & Spa is stunning not only because of its spectacular outdoors but also because of its gorgeous interiors and decor. 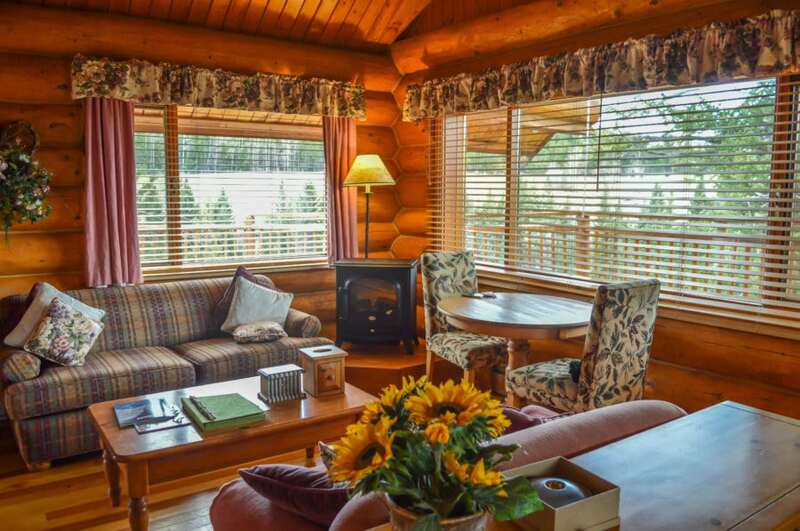 Using handsome local timber to create the cabins and lodges, Norm and Nan gave the property a cozy and rustic appearance. We stayed in a private cabin that, due to its slight seclusion, is referred to as “the Honeymoon cabin.” Outside was a wraparound private deck and beautiful views to the west. Every evening’s sunset was unique and glorious. 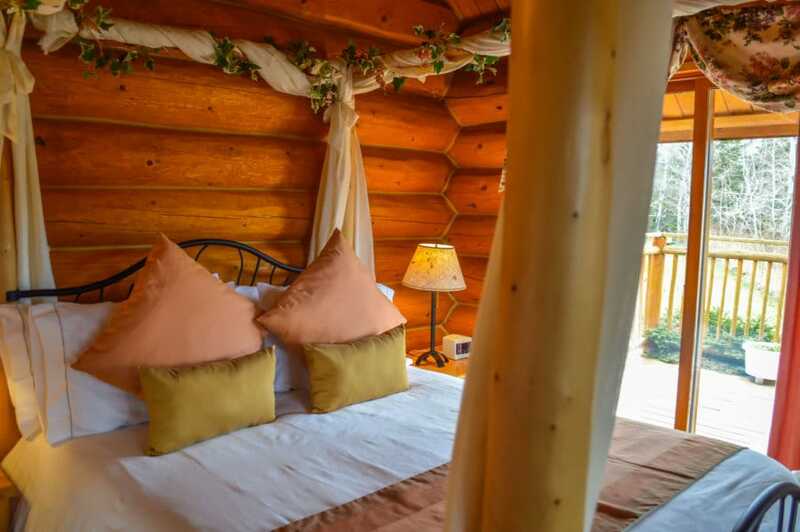 We weren’t able to view many of the other accommodations on the ranch, but if they are anything like our cabin, they are romantic, suffused with natural light, and boast inviting, luxurious bedding. We could happily live here forever. We spent a lot of time simply relaxing together during our stay. (After all, it was a honeymoon!) Fortunately, the ranch has plenty of space to spread out and cuddle up. One afternoon we sat on the sunny deck outside the Baan Thai and read books while swinging and enjoying the mountain views. To us, that kind of time just being is so well spent. This was in contrast to the hour we spent a few days earlier, learning to shoot guns out in the woods! Echo Valley staff member Darryl took us out to one of the farther reaches of the property, and there we attacked innocent water balloons with a rifle, handgun, and something big and loud that frankly frightened me to use!! Can you guess who was the better shot? 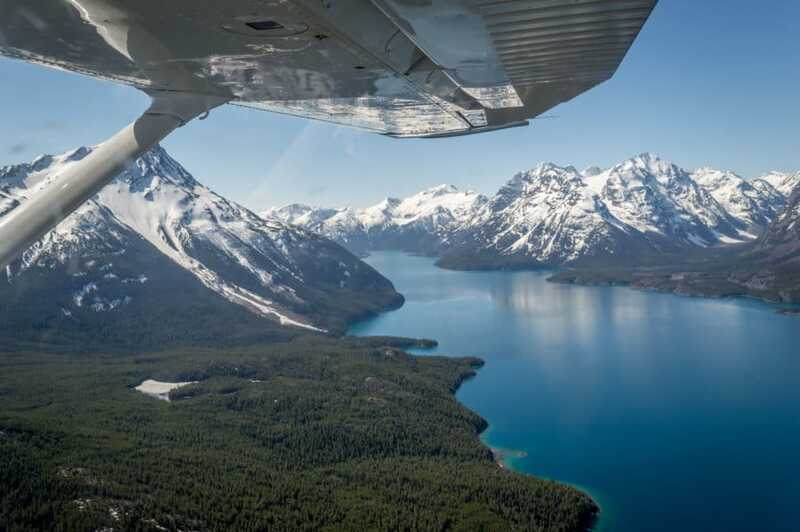 Perhaps the highlight of our stay was when owner Norm took us for a scenic flight in his Cessna. This was a first for me, but it was truly exhilarating. 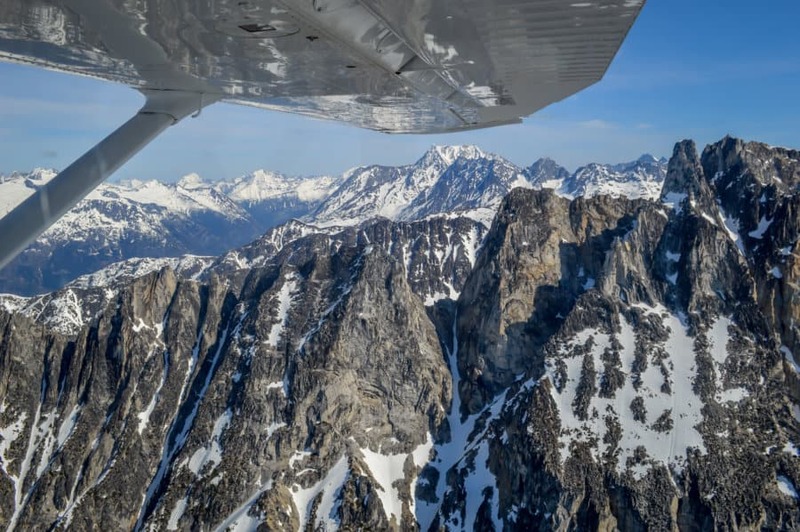 Norm flew us over glaciers and remote pars of backcountry British Columbia that he said very few people ever see. We felt really privileged to see views we couldn’t have imagined and to see the earth from the vantage point of the sky. We must have snapped 200 photos each during our flight. 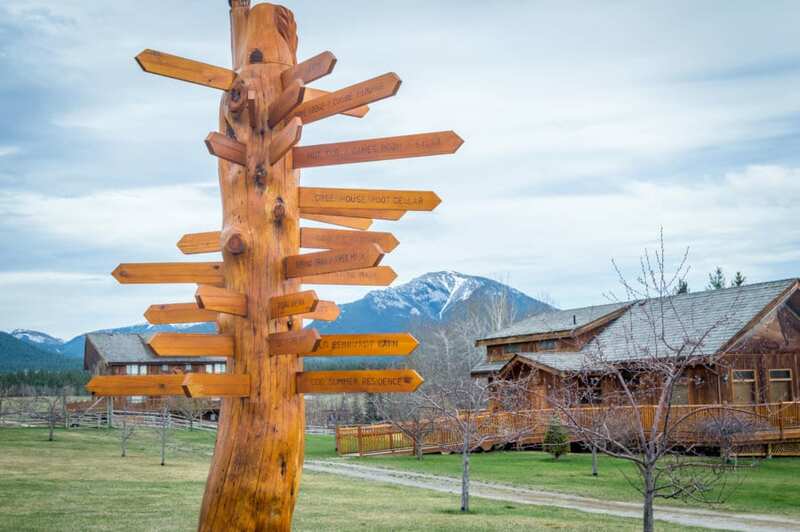 There are so many wonderful things we could say about Echo Valley Ranch & Spa. 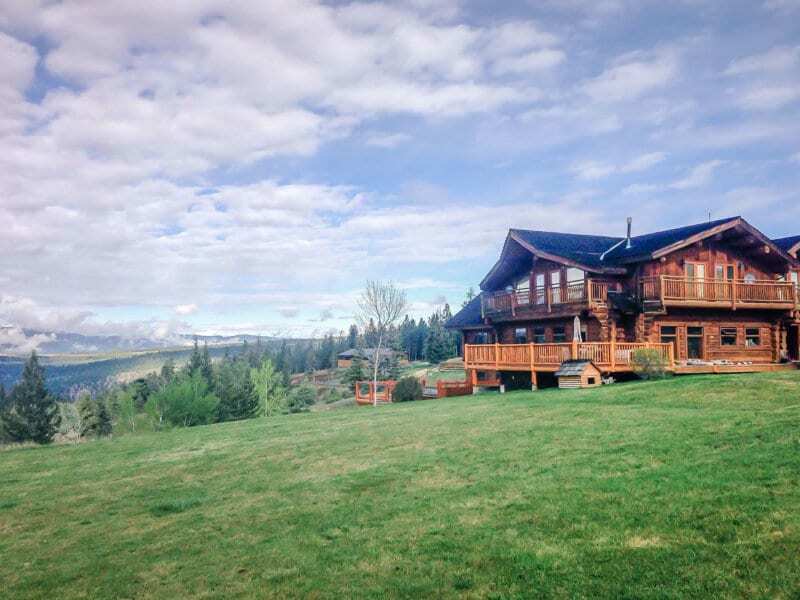 You never know what to expect when you come to a new place, but Echo Valley is a spot we would recommend 100%. It’s not only the unique adventures, the delicious food, or the incomparable scenery—it’s the people that really make a place, and the team at Echo Valley is straight-up awesome. Everyone is friendly, smiling, warm, and open. The staff know and greet you by name. Owners Nan and Norm are the ultimate hosts and they take steps to make sure your stay is perfect. With their happy sense of camaraderie, the team at the ranch is like a little family. Five days was certainly not enough to absorb all the magic of Echo Valley Ranch, but we tried to take in every single moment. 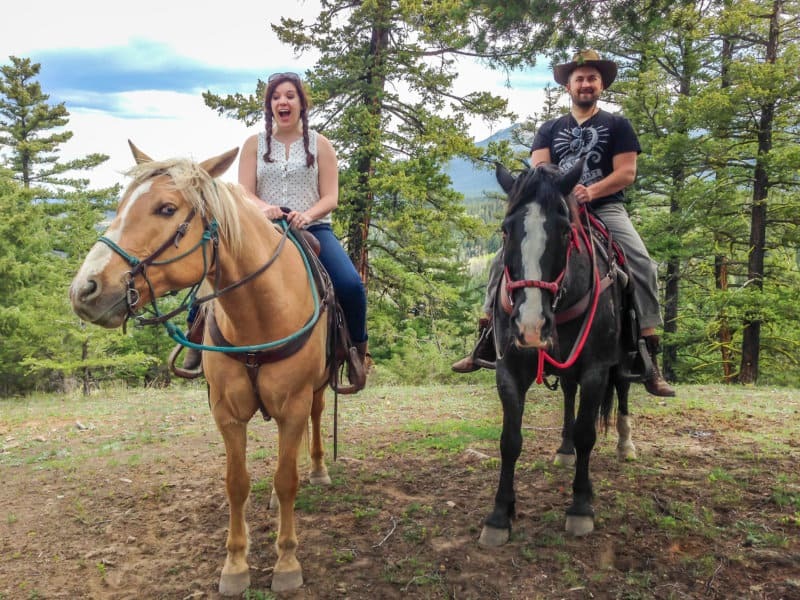 Our stay was generously sponsored by Echo Valley Ranch & Spa. All opinions and views reflected in this post are our own. those pic are really awesome.